Social justice champion and CNN political contributor Van Jones will soon be making headlines of a different sort as he takes the podium this spring at Loyola University New Orleans Commencement 2017. Jones will receive an honorary doctor of humane letters degree from Loyola New Orleans and deliver the commencement speech to more than 750 graduates at Commencement, to be held at 9:45 a.m. on Saturday, May 13, at the Mercedes-Benz Superdome. Later the same day, Fourth Circuit Appellate Judge, the Hon. Madeleine M. Landrieu, J.D. '87, H '05 will deliver the law school commencement address at Commencement 2017 for the Loyola University of New Orleans College of Law, which runs from 5:45 to 7 p.m., also in the Superdome. In February, Loyola announced Landrieu would be the new dean of the Loyola University New Orleans College of Law, starting July 2017. 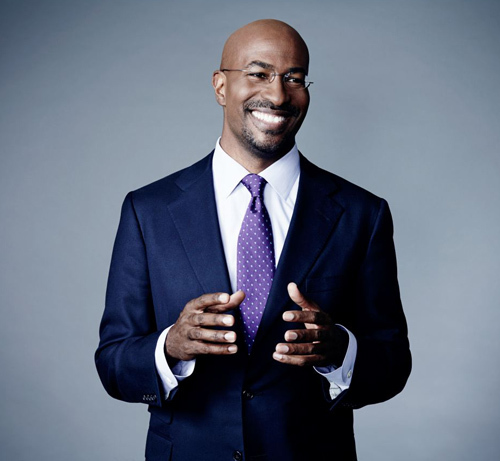 A Yale-educated attorney, Anthony Kapel “Van” Jones is the author of two New York Times bestselling books devoted to environmental and social justice issues: The Green Collar Economy and Rebuild the Dream. Jones served as President Barack Obama’s special adviser and primary advocate for the Green Jobs Act. Signed into law by President George W. Bush in 2007, the Green Jobs Act was the first piece of federal legislation to use the term “green jobs.” During the Obama administration, the legislation resulted in $500 million in national funding for green jobs training. As special adviser to President Obama, beginning in 2009, Jones helped to lead the interagency process that oversaw the multibillion-dollar investment in skills training and jobs development within the environmental and green energy sectors. Jones has also served as president of Dream Corps, as a distinguished visiting fellow at Princeton University, and as a co-host of CNN’s political debate show Crossfire. He is among activists featured in 13th, a 2016 documentary directed by Ava DuVernay about the U.S. justice system and factors that have resulted in the over-incarceration of minorities and the highest incarceration rate in the world. He has been a visiting fellow in collaborative economics at Presidio Graduate School and a senior fellow at the Center for American Progress and American Progress Action Fund and is presently a fellow at the MIT Media Lab. In 2004, the World Economic Forum recognized Jones as a Young Global Leader. In 2008, Fast Company ranked Jones one of the year’s 12 Most Creative Minds on Earth. In 2009, Time magazine named Jones one of the 100 Most Influential People in the World. In 2010, he received the NAACP President’s Award. In 2012, Rolling Stone named him among 12 Leaders Who Get Things Done. In 2013 and 2014, he was named to The Root 100. Jones has also been named to Ebony magazine’s 2013 Power 100 and 2011 Power 150, and in 2008, he was named to one of Essence magazine’s 25 Most Inspiring African Americans. He has been named one of National Priorities Project’s 30th Anniversary Democracy Champions and served as a member of the international Ashoka Fellowship. In true New Orleans fashion, Loyola will cap off Commencement 2017 with a traditional second- line celebration led by the Kinfolk Brass Band.